Cupertino real estate market's most attractive segment is the Townhome and Condominium market for good reason. First time homebuyers rely on this segment a lot to gain an entry into the world of home ownership and begin their journey to achieve there real estate dreams. From a pricing standpoint, the Cupertino Townhome and Condominium prices makes this market accessible to the buyers. How is this market segment doing? Lets review. For most part, the market continues to show tremendous demand even as prices have reached dizzying proportions. The thing that keeps the demand above supply levels is the supply levels itself. There is a acute shortage of homes in this segment. This segment also attracts a lot of investor interest who would eventually rent the property out. 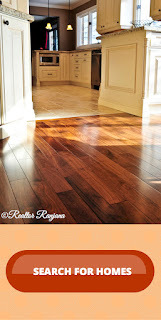 As Spring season comes in, it is hoped that more inventory will make its way making more choices available to buyers. 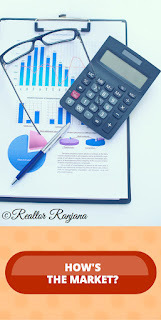 It also means that sellers who are not yet decided on whether to sell or not, may see increased competition from more homes selling as the home selling season comes in. 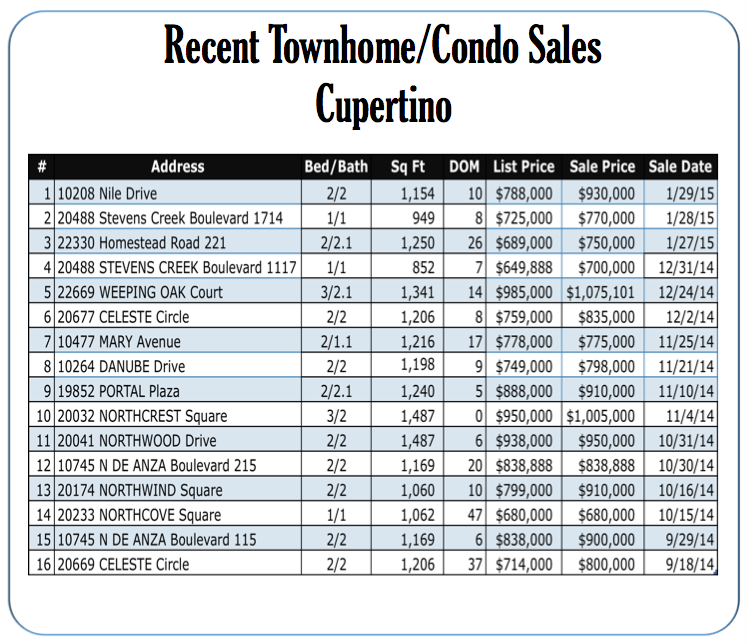 Here are recent sales of Townhomes and Condominiums in the Cupertino Real Estate Market area. As can be seen, most sales are above list prices although in some cases, the homes have been on the market for a lot longer than the average days on market for Cupertino. Also notice that there have been very few homes listed and sold from September, 2014 till January 2015. If you are looking to sell your home, take advantage of the limited inventory to get maximum exposure to all buyers in the market. I can help you every step of the way to achieve a successful sale. Please do not hesitate to contact me at (408) 861-8026 for a free, no-obligation consultation to discuss the sale of your home. If you are in the market to buy, your decision to invest now could make a huge difference with respect to building equity and continuing to pay rent i.e paying someone else's mortgage. Historically, low interest rates are a once-in-a-lifetime opportunity to take advantage of and to start building your equity. I can help you select the right home for the right price without pushing you in your decisions while guiding you every step of the way. 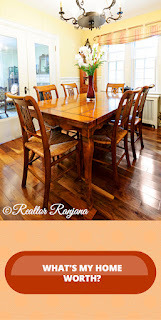 Call me at (408) 861-8026 to setup a suitable time to discuss your real estate needs. How much is your home worth? Don't rely on automated estimates. Click here to get your pricing done right!